Photo: CBS This Morning screen capture. As it stands, chemotherapy is one of the most difficult things anyone could have to go through on this Earth, especially when it comes to healthcare procedures. The potential side effects of this debilitating treatment include hair loss, nausea, vomiting, and according to recent research, it even has the potential to spread to healthy cells and create more advanced, malignant tumors in the body. While there are plenty of people who have overcome cancer naturally without chemotherapy, it goes without saying that only people who truly have cancer should be administered the treatment (if anyone, considering what this doctor told the American Cancer Society back in 1969). But according to longstanding accusations against one Detroit doctor, over 500 people were allegedly given chemotherapy in what could be one of the most horrific medical scandals of our time. 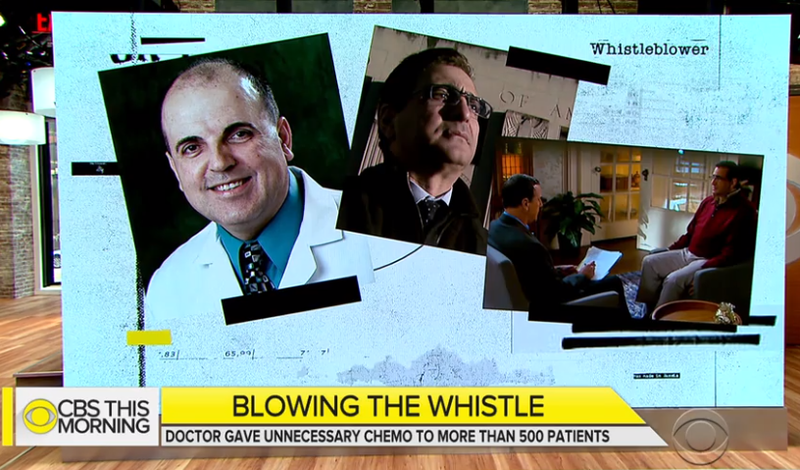 The story of Dr. Farid Fata has made the rounds for many months now, but recently CBS News blew the lid off of the case even further during an episode of the series Whistleblower, which aired on Friday, July 20. Featured in the program was Dr. Fata’s office manager George Karadsheh, who risked his job in order to expose Dr. Fata’s questionable practices. “I couldn’t believe … what was in front of me. 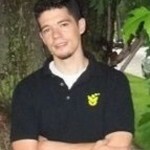 I couldn’t believe what I was seeing,” said Karadsheh, who took a job at his oncology office in suburban Detroit in 2011. Karadsheh was surprised one day to find out another oncologist and two nurses were on the verge of leaving. When confronted by Karadsheh, the oncologist told him the words he would never forget. “Patients were given chemotherapy and other treatments when they didn’t have cancer,” he said. Watch the video below from CBS News to learn more. While the chemotherapy industry rakes in big bucks and some people do benefit from chemo, the unfortunate truth is that thousands of people are overdiagnosed each year, and many suffer and even die unnecessarily. According to recent research there are two main types of cancer that people should be especially careful of when it comes to being overdiagnosed: thyroid cancer and breast cancer. If you know anyone who’s been diagnosed with these diseases, it’s more important than ever to research and discuss these study results with your doctor. Lost in the shuffle of the glamorous “pink ribbon movement” promoted across the country by Susan G. Komen and many others is the monumental epidemic of breast cancer overdiagnosis. According to a data review in the New England Journal of Medicine, an estimate of over 1.3 million women in the U.S. over the age of 40 were overdiagnosed with breast cancer in the past 30 years. The problem is not just a historical one: it has continued strongly into the 21st century, including in 2008, one of the most erroneous on record for these types of diagnoses. In that year, an estimated 70,000 women were overdiagnosed, in this case meaning that the tumors likely would never have lead to clinical symptoms or caused much if any harm. In total, 31 percent of all breast cancer diagnoses that year were due to overdiagnosis, a shocking number considering the constant mantra in the media imploring women to come in and get checked for cancer (this massive advertising push to screen and diagnosis women leading to failure was profiled in the popular book ‘Pink Ribbons, Inc.,’ written by author and college professor Samantha King). Stories of overdiagnosis or unnecessary treatments like those alleged against Dr. Fata may seem shocking, but this type of thing happens often, and not just to breast cancer patients, either. In fact, it may be the biggest reason for the growing thyroid cancer epidemic according to one major world health body. According to The World Health Organization’s International Agency for Research on Cancer (IARC), this epidemic is largely due to overdiagnosis of the disease, as it was found that thyroid tumors discovered in as many as 90 percent of all patients in high-income countries are never likely to lead to any symptoms during their lifetime. It may sound too crazy to be true, but it’s happening to people in huge numbers in multiple in countries in Europe, as well as the United States. Categories: Alternative Medicine, Cancer, and Natural health. Tags: breast cancer and chemo, chemo overdiagnosis, chemo thyroid breast chemo, dr. farid fata overdiagnosis, healthy people given chemo, healthy thyroid breast cancer chemo, michigan doctor chemo detroit, overdiagnosis michigan doctor, thyroid cancer diagnosis, Thyroid Cancer overdiagnosis, and thyroid overdiagnosis.